It’s almost considered criminal to live in Australia and not cook regularly on a barbecue. It’s part of our heritage; part of our life style. When the weather warms up, we get out side and cook. It’s a fabulous thing. There were a number of years there were I didn’t own a barbecue (shock horror). I had to get my fix of barbecued foods at other peoples houses. This was so un Australian of me. Then, I was given a barbecue as a gift. It was no Kmart job either. It was one of those small yet stylish type barbecues that runs on charcoal, or gas, or both. The gas element is great for when you’re in a hurry, and the slower method of cooking with the charcoal delivers a flavour that just can’t be matched on any indoor stove. I feel complete. But let me tell you about these tasty lamb skewers. They have become my favourite. You’ll need some preserved lemons. Preserved lemon and lamb go together like presents and Christmas. 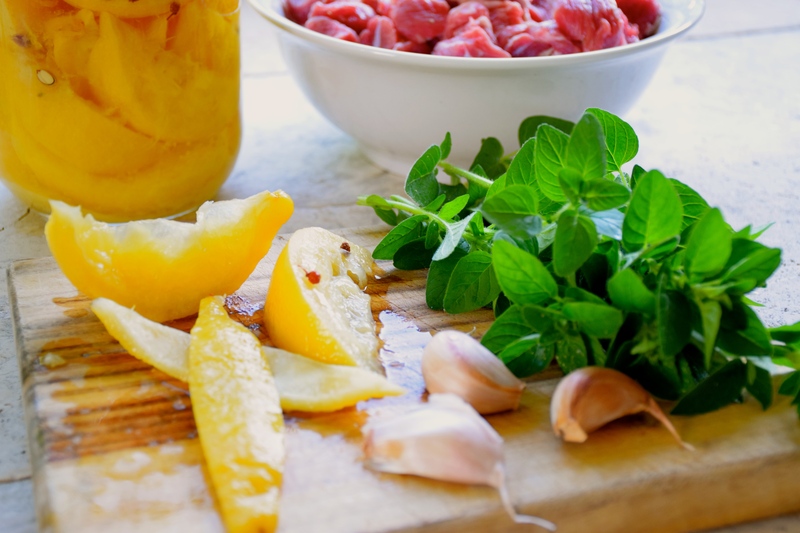 The other special ingredient I’ve used in the marinade is Lemon Myrtle. Have you heard of it? It’s a native Australian bush herb. It’s fairly pungent, yet delicate in it’s lemon scented flavouring, which also highlights hints of lime. Truth be known, this lamb was only marinated for 3 hours. It most certainly can be marinated over night, and if I wasn’t trying to feed my husband’s work friends, who conveniently popped in that day, as well as get a shot of the lamb while the light was still good, I would of left the lamb to marinate longer. I often serve lamb skewers with yoghurt sauce. On this occasion I snipped fresh mint from the garden, roughly chopped it, grated a cucumber and squeezed the excess water from it, and added it to the yoghurt with extra virgin olive oil, black pepper and sea salt. Dice the lamb into 3cm pieces. Remove the pith of the preserved lemon and discard the pulp, keeping only the rind. Roughly dice the rind and place in a food processor with lemon myrtle, garlic, oregano and oil, blitz till well combined. Pour over the lamb, gently massage it into the meat, and set aside to marinate in the fridge for 4 – 24 hours. 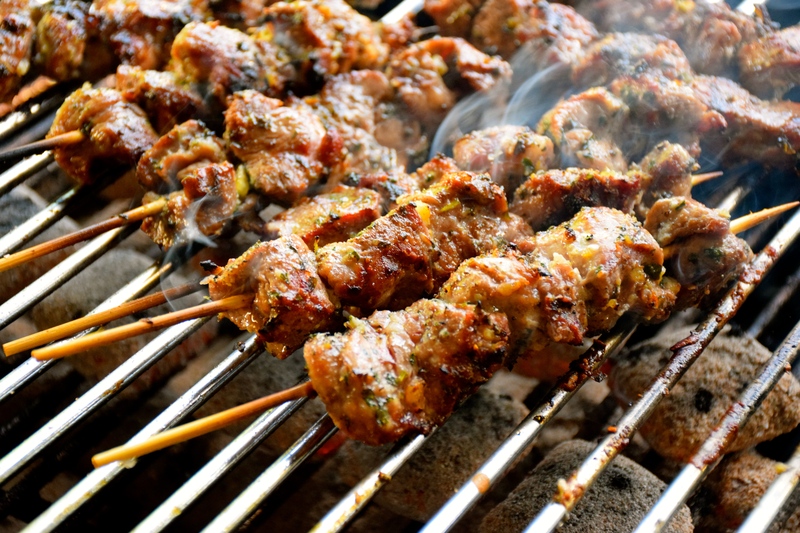 Soak 12 skewers in cold water for 15 minutes (this helps stop the wood from burning). Pre heat a charcoal barbecue. Skewer the lamb evenly between the bamboo skewers. Season both sides with sea salt and cracked black pepper. Cook the lamb over a medium heat, for 8-10 minutes, turn regularly. Set the lamb aside to rest for 5-10 minutes before serving. Serve lamb skewers with minted yoghurt and your favourite salads. I must be part Australian. I’ve a gas grill right outside my kitchen door and use it all year long, on Summer’s hottest days and Winter’s most frigid. 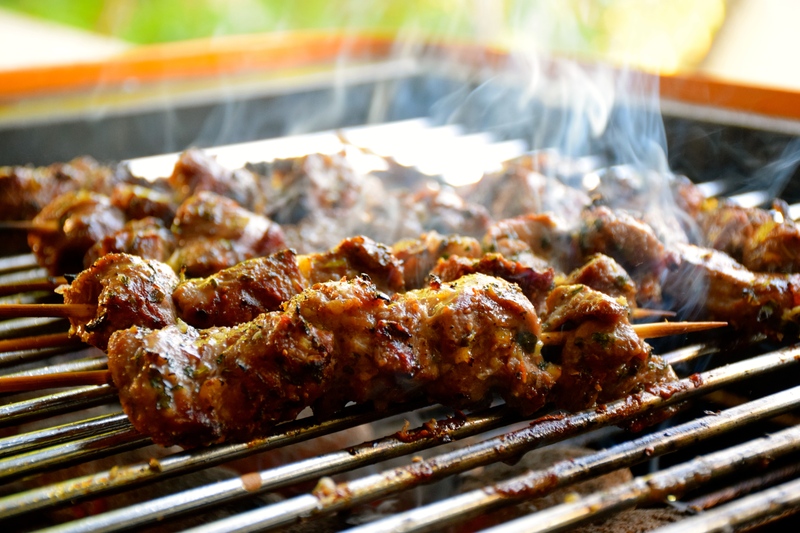 Your lamb skewers will make it worth my while to get that grill going, no matter the weather. They sound delicious! Great to hear you’re still barbecuing in winter. Let me know if you can easily get your hands on lemon myrtle on that side of the world. Please do barbecue as much as you can… here in Montreal at the time I’m leaving this message it is snowing ! Excellent recipe. I leaned about lemon myrtle here. As soon as rainy days are over in SF Bay Area, my barbecue is on! Thanks for sharing this recipe. Yum!